Converted from an old 1920s cinema, The Palladium is a striking and elegant public house, With old, theatrical seating booths and a viewing platform still in tact, The Palladium is an elegant, Edwardian, Friday night haven. The original Winter Gardens in Harrogate, North Yorkshire were built so that visitors of the Royal Baths could walk freely amidst flowers and greenery despite weather restrictions. During the 1930s, the Municipal Orchestra would play for free every morning of the year, for patrons of the baths. Following their closure in 1969, Wetherspoon acquired parts of the land. Nowadays, the entrance to the pub is still flanked by beautiful plants on either side of the winding concrete steps. With a similar vibe to The Palladium, The Opera House in Tunbridge Wells is over-flowing with class and history. 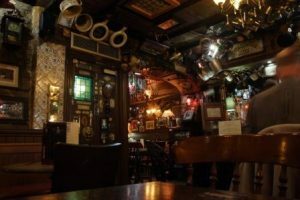 Once a year, for three days, the pub reverts back to it’s initial function, and customers can go there to watch live opera. The premises of The Counting House were once owned by the Bank of Scotland and designed by the architect John Thomas Rochead, in the Italian Renaissance style. Some of the old building has been retained, like the bank’s former vaults, and there is a large glass dome in the ceiling; perfect for gazing at, drink in hand.